Food photography is arguably one of the most challenging types of photography out there. Like painting, you start with a blank canvas and build. Layer upon layer, you construct the photo until you reach the perfect balance of reality and art. Everything in the photo is a decision. Every piece is perfectly placed by the photographer. Good food photos are a turn on. So how do you photograph food and get such great results? Only six things you need to know and you’re on to becoming a great photographer with a key for details. Come join in to know more of food styling tips and tricks for the camera. 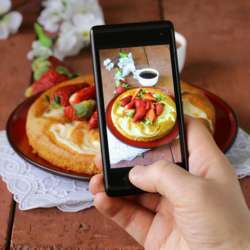 • Understand the business aspects of food photography. • Shoot on a budget with a smartphone or camera. • Learn food styling for various types of food. • Finally, write about food and create a blog. Admission by donation of RM 60.00 per pax until January 21st. Reserve your seats now as it's limited seating on First Come First Serve upon payment received. Once payment is done, a confirmation email will be sent to you with an address.